Polar Bears International is a website set up to help save the habitat of the polar bear, the sea ice that they call home. This includes the Arctic, Alaska, Russia, Greenland and Norway. The website’s method of doing this is focusing on climate change. They have many different suggestions on how to do this for people in many different positions; they look at how students and teachers can be leaders in the community for more green living. They look at what scientists, corporations and even small businesses can do to improve their greenhouse gas emissions.The website also has information on temperature trends, how the arctic is changing more specifically in terms of ice flows and the ecosystems overall. They make sure it is clear that there is no real debate on climate change anymore either, stating the common statistic that ninety seven percent of climate scientists agree that climate change is occurring and that it has Anthropogenic causes. This website is a great resource for information relating to climate on the arctic, and more specifically polar bears, as well as what to do to get involved and help be part of the solution. GEOLOUNGE is an informational and interesting website. It has information about physical geography, human geography, maps, and more. Under the physical geography tab, they have tabs for biogeography and climatology. After learning about both biogeography and climatology in our class, I was intrigued by the different articles that I found. I wanted to share this article, “These Wolves in Minnesota are Very Very Territorial” that is posted on their site because it relates to our class. 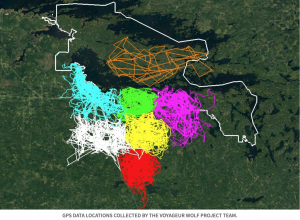 The article discusses how researches have used GPA collars to track the movements of 7 wolves at Voyageurs National Park in Minnesota. The data that was collected on the wolves locations is being used to understand pack boundaries and for the Project’s predation research. The screenshots I have included below show the travel paths for each of the wolves. The travel paths show how each pack adheres to territories with little overlap with other packs in the area. 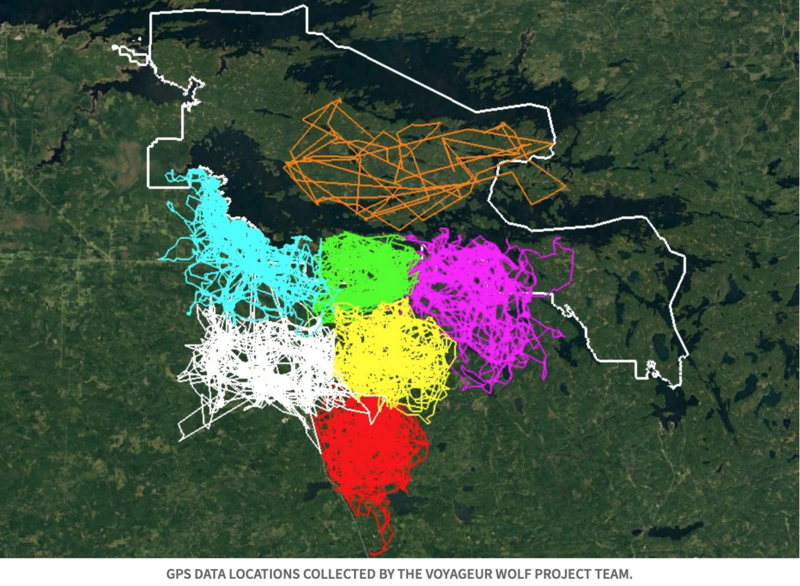 I thought GPS tracking of the wolves is an interesting concept and could be used to track more animals and possibly provide insights about animals travel habits which could be used to make better protected conservation areas. After reading this article, I clicked on a related link: “Using Remote Sensing for Mapping and Counting Animals.” This took me to GISLOUNGE, which is also another interesting and informational site, related to GOELOUNGE. The website I found is called RealClimate: Climate science from climate scientists, and it includes a few interesting sections. There are published research papers, new articles pertaining to climate science, and an open thread where people can post on climate science topics. They also have a bimonthly thread where people discuss responses and solutions to climate change. I looked through a few of the posts and discovered several interesting suggestions for solutions to climate change, including the Renewable Revolution and Regenerative Agriculture. The Renewable Revolution refers to making a transition to renewable energy, including technology like solar panels and wind turbines. Regenerative Agriculture is an approach to farming that does not use pesticides and also helps regenerate topsoil and increase biodiversity. There are also some really good graphs and tables on global temperature and other data pertinent to climate. The website is really interesting, especially the commentary made by professionals in the field of climate science. Mashups use mapping services or photo services to produce visualizations of data. Combined with GIS, a mashup allows for the combining of multiple sources of data into one integrated spatial display. It allows for the extracting of spatial data from a non-spatial source and displaying it on a map. The MapYourList mashup converts lists into maps and annotations, and share or export maps in a variety of formats. MapYourList is great for thematic mapping. MapYourList.com will determine if a data set contains values that can be thematically mapped and offers the option to create a thematic map. 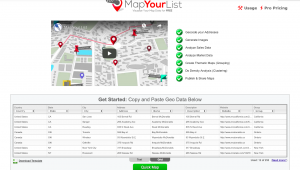 MapYourList.com makes it easy to convert your list of addresses into map locations as well as allow you to copy and paste data. Once the data is copied and pasted you will also want to set what each column is. 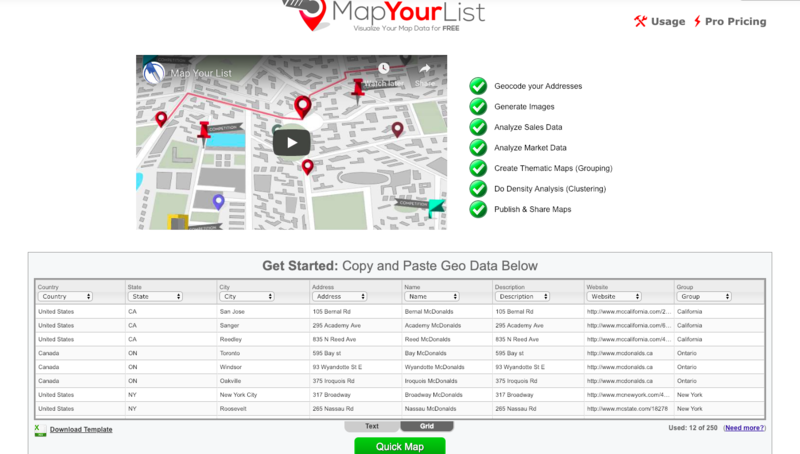 MapYourList.com will also allow you to customize and set what each column is and it can also do it automatically. The web application requires you to specify title, description, and password to your map to allow for later editing and for secure viewing of the map. The application also has a variety of options for map sharing such as widget/embed codes (for websites and blogs), image saving, emailing, and KML file saving. ArcGIS Online has a public database of professional Storymaps on a variety of environmental and global issues. 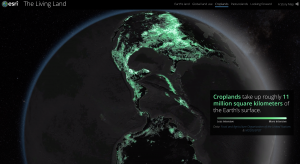 You can explore one series of storymaps titled “The Living Land,” on the distribution of human activities on the surface of the Earth. Chapter Two of this resource takes a special look at the distribution and impact of agriculture, animal husbandry, and farm land on the Earth. 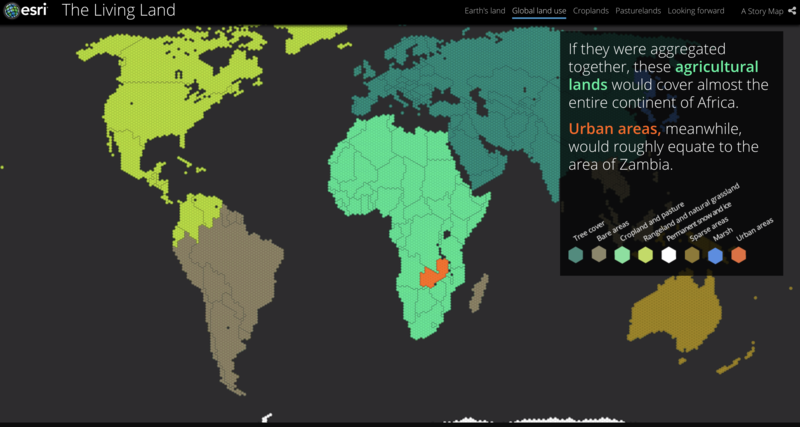 This storymap takes the user through the distribution as percentage of land, by regions of the world, density, and areas of highest production. It also describes how crops change the land and how each of humanities major crops (corn soy, rice, etc.) and major livestock (cows, chickens, goats, etc.) 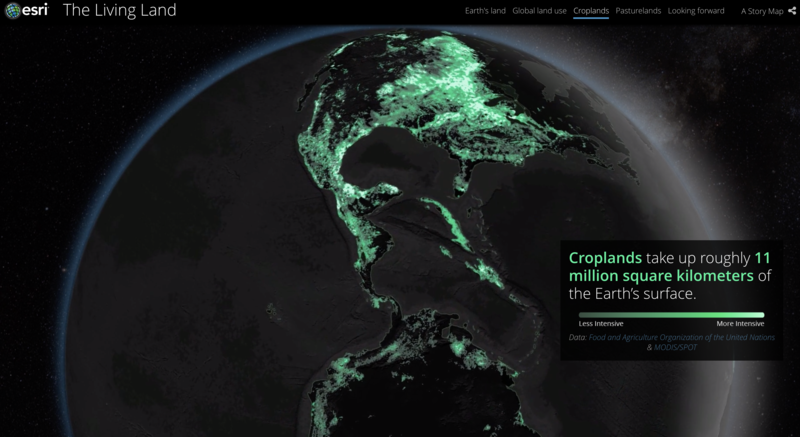 are grown around the world using aerial imagery. This storymap relies heavily on maps, as it should, to demonstrate these environmental and social issues. This includes simplified dot representation of the predominant crop in one area, to spinning globes with particular crops highlighted. 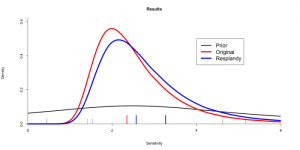 This web application is a useful tool to demonstrate spatial distributions in a way that is easy to understand. It takes you through a whole system of human behavior around the world and its impacts on land (impact on pedosphere) depending on different practices. Gapminder is a helpful data-visualization website that enables you to analyze data trends spatially and temporally. 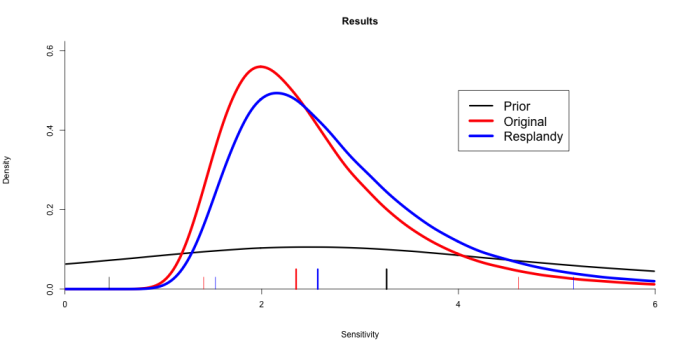 You can visualize a range of country data using a map, trend lines, or a ranking bar graph. For each option, you can watch an animation of change over time. The available data is broken down into categories such as economy, energy, environment, population, and society. There are a many datasets embedded in the website that are very relevant to our discussions in class. One is water withdrawal (you can see it if you click on the map header and select environment > water > water withdrawal/person. I chose to compare South African and the United States over time (you can do this by pressing the play button on the bottom left corner of the data viewer). I was surprised to see how dramatically the USA has reduced its water consumption over time. This tool also helped me visualize the large gap between US water consumption and SA water consumption. NASA’s Scientific Visualization Studio (SVS) showcases a wide variety of NASA programs using striking images, animations, videos, and other visuals. By synthesizing complex scientific research and data with visual elements, the Scientific Visualization Studio creates a largely accessible platform to promote education and a broader scientific understanding of earth and space processes. The website has curated various galleries tied to specific NASA projects. These collections range from Air Quality to Astrophysics to Carbon and Climate projects. One of the featured collections is of ICESat-2, or the Ice, Cloud, and land Elevation Satellite-2, which launched on September 15th, 2018. ICESat-2 is NASA’s most advanced laser satellite instrument (ATLAS) and will be used to monitor changes in height, depth, and mass of ice sheets and glaciers with extreme levels of precision to better understand and predict sea-level rise. ICESat-2 will also provide essential information about forest vegetation, ocean surfaces, and urbanization, among other applications. To explain what the ICESat-2 project is hoping to accomplish and how they have gotten to this point, the SVS with Goddard Media Studios has produced many videos that explore the importance of ice sheets, how the laster altimeter technology works, and even documenting the 470-mile research expedition in Antarctica that accompanied this project. This website, with its galleries of scientific information and mapping related to climate change, glacial melt and sea level rise, hurricane and storm impacts, stratospheric ozone depletion, and forest fire intensity and prevalence are all topics we have discussed in our class. Additionally, projects like ICESat-2 demonstrate how different remote sensing technologies are being implemented for environmental and geographic research purposes. This website tracks present lightning strikes and includes a database of past lightning, using colored dots on a world map to show the locations of strikes. The map on the homepage updates almost in real-time, with a delay of only a second or two, allowing you to see lightning as it strikes in Europe, Oceania, or North America. You can also use the website to see past lightning strikes in each of the regions, and you can view this information either as still images or in animations that show the lightning throughout a given day. In addition to documenting the lightning strikes themselves, the website also keeps track of the density of strikes, or how many strikes are occurring in close proximity to each other, and information on the the number of strikes that have occurred within any month in 2011 or later and for each full year in 2011 or later is also available. The content of this website relates to our course in that it allows for a visual representation of storm systems through the electrical charges they produce. For example, when I looked at the real-time animation, the enormous number of lightning strikes occurring in the Gulf of Mexico indicated there was probably a large storm or storm system in the Gulf at that time. Similar evidence suggested to me there probably was a storm occurring in far Southeastern Australia. This website, examined over a period of time, would allow for an increased understanding of the trends affecting the development of storms likely to produce lightning. Such storms may be from larger systems, such as midlatitude cyclones, or they could be the result of isolated convection patterns in areas such as beaches, cities, and cropland. Nevertheless, the representation of lightning overlaid on a map allows for an understanding of where lightning-producing events tend to occur, and in which locations larger storm systems are likely to cause lightning and in which locations it is more likely that an isolated event is the cause. Additionally, the graphs available on lightning patterns over a period of months or years provide the opportunity to observe any trends in lightning strikes that may take place over time and to determine in which parts of the year lightning tends to strike the most.